Lemon Grove was not always the bustling city it is now. Many wonder what did it used to be, who occupied the land, how it looked, and when it was settled. Anyone wanting to know need go no further than the Lemon Grove Pastry Shop on Main Street to enjoy the city’s illustrative history painted onto five separate murals on the side of what was the Sonka General Store of the early 1900‘s. Mural number five which is the final piece and depicts modern times, was put up last week under the direction of Lemon Grove Historical Society President Helen Ofield. She conceived the idea of murals telling the story of Lemon Grove from Kumeyaay Nation all the way to modern day 2013. The mural project began its design phase in 2005 and the painting began by 2006. Artists Katy Strzelecki and Janne LaValle were commissioned to do the painting, with LaValle (who is now painting murals in Oregon) doing the backgrounds and landscapes and Strzelecki painting the people, living creatures and much of the finer details. Ofield and Strzelecki were on site for the final mural installation due to their investment of time, research, and energy involved. “When I was seven years old I started painting, I come from a family of artists, and I studied art in college in Los Angeles at Chouinard,” Strzelecki said. Strzelecki had surgeries and took some time off but came back strong to finish mural number five, which took approximately two years. After the finished mural received an anti-graffiti treatment, it was ready to complete the Lemon Grove story. Mural one begins with the Kumeyaay people. Created from research and communication with the Kumeyaay Nation, who gave the project their blessings, the scene of Native American families are gathered and working in their natural environment. 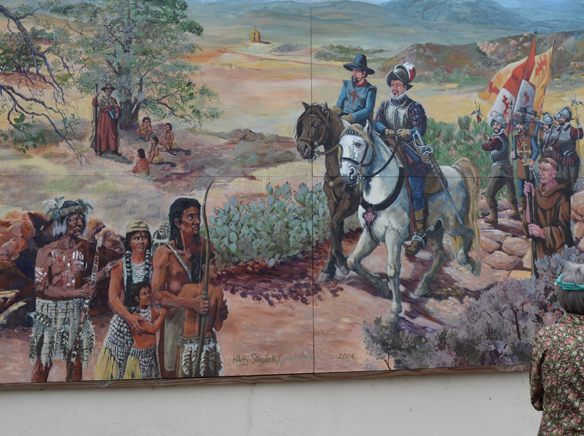 Mural two represents the Spanish Conquest of the 15th and 16th century, with Conquistadors on horseback among Native Americans. In mural three, Mexican heritage is represented from 1821-1846 with a wedding scene on a ranch. Brides riding horses, a mariachi and a dancer characterize a festive scene. Names of inland communities are painted on the branches of a tree. Mural four makes a shift to the latter part of the 19th century, with two churches, a school house, and a general store with a horse and carriage “the delivery service of the time” Ofield pointed out, and former home of the Troxells, an enterprising couple who built what was the Stagecoach Stop that helped bring commerce to the area. A young schoolteacher wearing what Ofield calls a “Gibson Girl” outfit, based on a real life schoolteacher Ada Samples, stands in front of a group of students. Lemon Grove got its start because of entrepreneurial pioneers such as the Troxells and the Sonka family. The merchantry they brought to the region shaped the city as it grew and kept up with the larger, sprawling region that became San Diego County. “Tony Sonka was the Big Enchilada, he ran the general store until he sold it in 1945, he saw it through World War II. There is almost nothing this man did not to. He bought the first school bus, the first fire truck,” Ofield said. He is also the first to call Lemon Grove “Best Climate on Earth” (which you will also see on mural five within the city logo). Tangible parts of this booming time in Lemon Grove history remain, such as the original school bell, endearingly named “Mrs. Bell” that is now housed at the Lemon Grove library. The stained glass windows from one of the original churches in the mural are in possession of the Lemon Grove Historical Society at the Parsonage Museum, waiting for a chance to be admired again. Finally, mural five shows the 21st century city in its diverse splendor. “It is a celebratory explosion of joy, flags flying, kids everywhere, founding mothers and fathers of the modern Lemon Grove. We’ve reached back in time to just a few pioneers but most of the people depicted are contemporary and they tend to represent firsts – the first city manager, the first woman mayor, the first woman on the city council,” Ofield said. The Sonka General Store is now the Lemon Grove Pastry Shop. In addition to the “firsts” Ofield speaks of, today’s residents can identify with the current images as well as less recent ones. The trolley, a fire truck, farm crates filled with produce and a child in a LaDainian Tomlinson jersey. The impact of everyday citizens in mural five is broad, colorful and detailed. More than a few minutes passing by are required to take in the reflection that went into the panoramic stories and craftsmanship. Each mural has something that will resonate with people. That’s the idea. Beneath the mural scenes and the people portrayed is the profound sense of shared space with predecessors that can easily be forgotten. Some of the history in Lemon Grove is so obvious, it is easily missed. The church steeple in mural four did not make it past World War I, and only one lemon orchard remains today, but the mission to preserve and honor the living history of Lemon Grove is sustained despite cuts in redevelopment funding. Artists Strzelecki, LaValle and those passionate about the past like Ofield have left an indelible mark on history, simply by keeping it alive. web site before suggesting that I really enjoyed the usual info an individual provide for your guests? I never expressed respect to the blog owner for them. Those young men came very interested to study them and have now in fact been enjoying them.